Why Backup iPhone before iOS 12 update? Backing up photos is a great habit just that you have to remember to do it! Have you regret that you forgot to backup your precious photos from your iPhone after you lost your phone? Have you tried to find the best way to backup your large amount of photos in HEIC HEIF when you decided to change your phone? Never mind, because when you search the term of "the best way to backup photos" and come to this article, you are in the right place. We won't let you leave without a solution. ★ One-click back up all photos from iPhone to Mac/PC. ★ Manage HEIC HEIF JPG photos on your phone freely. ★ Download and transfer photos from computer to iPhone as well. 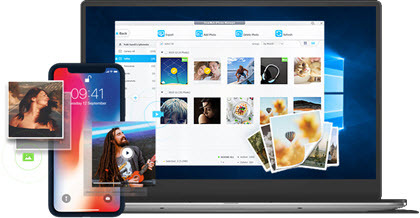 There are a lot of iPhone backup software powered with the feature of backing up photos from iPhone, such as WinX Mediatrans developed by Digiarty, Anytrans of iMobie, iExplore, Tunesgo, etc. as well as Apple's native service iCloud, which can automatically backup iPhone to cloud Transferring photos between phones and computer is just a basic function of those tools. But they are not quite considered as phone manager, besides they are not free. The iPhone photo backup tool (iOS 12/11 and earlier supported) developed by DearMob is a brand new yet powerful iPhone backup software, transfer files between iPhone and computer. This iPhone photo backup tool is super neat and safe. With iPhone manager, you don't need to sacrifice your photo quality to back up iPhone photos via uploading photos online, or go through the tedious steps to backup photos with iTunes. Step 1: Free download this iPhone photo manager on your Mac or PC, and then launch and install it. Step 2: Connect your iPhone with computer with USB. Step 3: Click Photos on the main interface to come to the photo manage center. 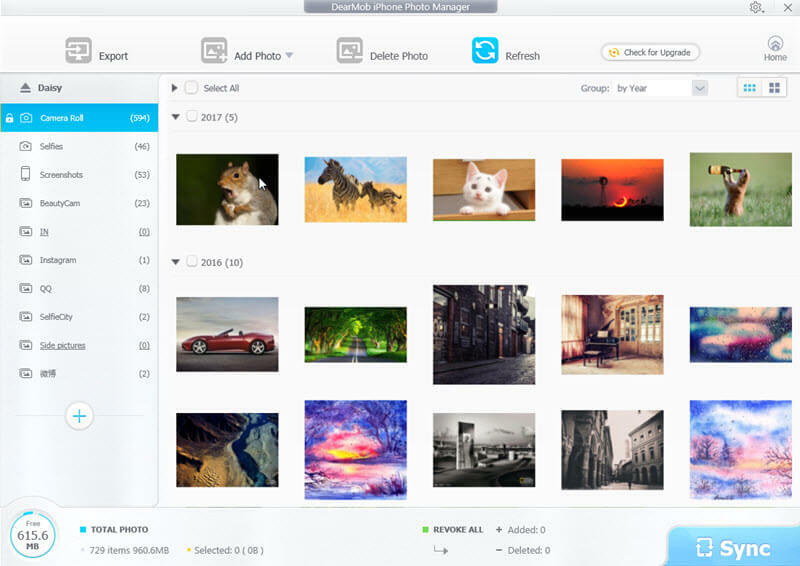 Step 4: Select the photos you want to backup to computer and hit Export. Done! The photos you just selected will be saved to the folder named "photo manager" under disk D by default, you can also set the preferred destination in the setting section. If you're trying to backup photos from iPhone XS/XS Plus/X/8/7 Plus/7 powered with iOS 12, and would like to view the photos on Windows 10/8/7 now and then, you'll need one of the top 3 HEIC converters 2019 as HEIC HEIF photos won't natively open on Windows computers as JPG pictrues do. Every time when you insert iPhone to PC, a window will pop up and ask if you would like to iOS 12 backup photos and videos to computer. It assumed to be the best way to backup photos if you only want to transfer the al pictures in Camera Roll from iPhone to PC. Yes, it doesn't care about date or albums, so sometimes you might backup the previous transferred photos or the photos you don't want to backup. 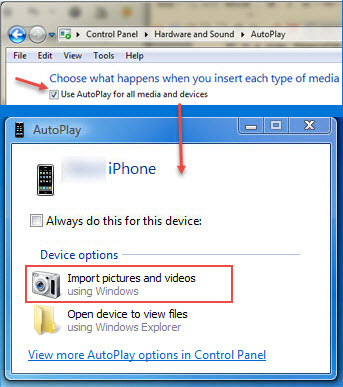 Step 1: Select "Import Pictures and Videos" from the Autoplay menu, if the Autoplay menu doesn't show, following the steps below to download pictures from iPhone to PC. Step 2: Go to "Computer", click your iPhone 7 in the portable devices column. Step 3: Open "Internal Storage", and then click "DMIC", you will find all your pictures there. Step 4: You can just drag & drop or copy & paste the pictures you want to download from iPhone 7 to the destination folder on PC. With this tool you can also restore iPhone without iTunes. Should you run into the photos with *.heic as an extension, you may refer to this guide on how to solve HEIC won't open on Windows. 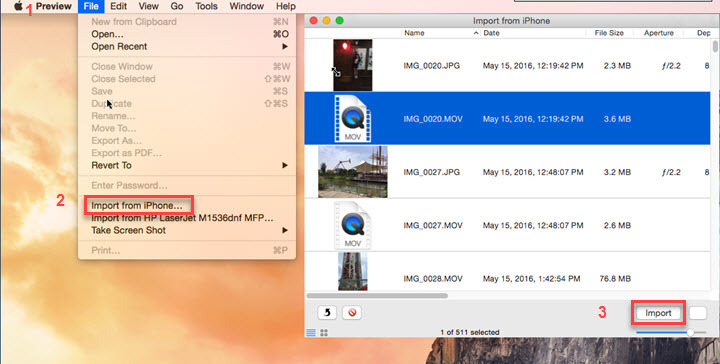 There is also a built-in feature in macOS to enable you to transfer photos from iPhone to Mac with Mac Preview. Step 1: Launch preview App on your Mac. Step 2: Click File and select Import from iPhone. Step 3: Choose the photos you want to backup from iPhone to PC. Step 4： Click Import on the bottom and then select the destination folder you want your photos to backup to. Tip and Notes: HEIC photos won't open on Mac computers with a system earlier than macOS High Sierra.